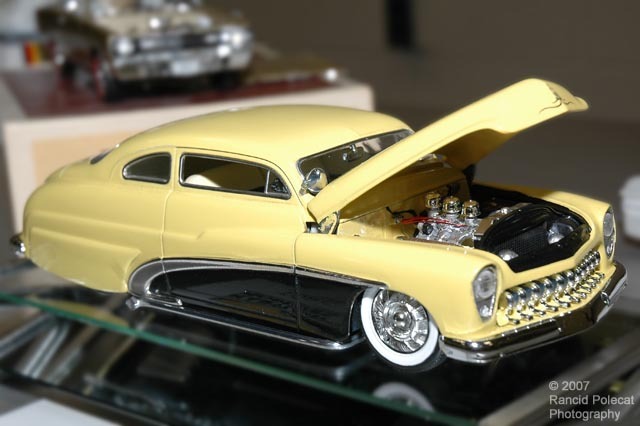 Lyle started with Revell's newly released custom 1949 Mercury kit as it's top was already chopped exactly as the Merc depicted in Dave's drawing. To the kit body, Lyle added the requisite 1953 Buick side trim in resin from the Replicas and Miniatures Company of Maryland, mastered by Rik Hoving. What looks more like real car paint than real car paint? Lyle relied on Duplicolor color Light Yellow for the majority of the body and Duplicolor Universal Black for the area below the Buick side trim. The top is topped off with several coats of clear lacquer and polished. Because the original drawing was a direct side-view, the front end is somewhat open to interpretation and Lyle opted for Modelhaus resin Buick headlights with clear lens added from his parts box. He added some fine pin striping to the nose as a finishing touch.